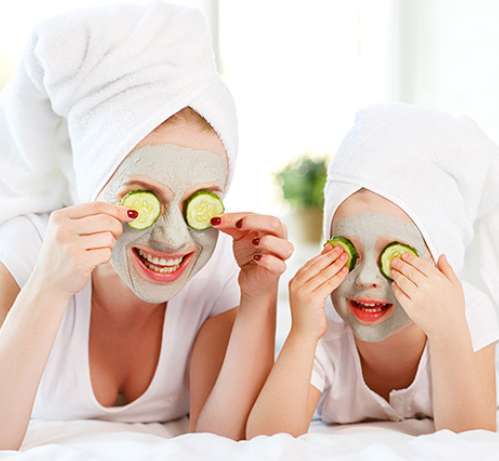 Mummy & Me Spoilt Spa Package – 2hrs - $220 Matching Spa Robes and Spa Headbands to wear Spa music to provide ambience Relaxing foot bath with Rose Petal foot salts Anti-Ageing Nourishing Collagen face mask for Mum & Chocolate Face mask for daughter Refreshing foot scrubs and Heavenly foot massages Pedicures for Mother and Daughter: trim, file, cuticles groomed, and your choice of polish, glitters and nail art. Heavenly hand massages Manicures for Mother and Daughter: trim, file, cuticles groomed, and your choice of polish, glitters and nail art. Mini Makeover for Daughter: age appropriate sparkle makeup, glitter hair and glitter tattoo. 10min Seated Back, Neck & Shoulder Massage for Mum. NB: Daughter's can choose to have a massage instead of Mini Makeover if preferred. Additional Child: $65 (17 years and under). This will extend the duration of the package. NB: Mum can swap out the Manicure (if you have gel/acrylic nails for a massage instead). We look forward to pampering you both soon!